Use the Select Element command to select an element in order to highlight graphically or to view, update or modify its attribute data. To use this feature click on the icon and you will see a yellow colored, small rectangular cursor. Hold the mouse down and drag the cursor on the element you wish to be selected. Use the Select Elements command to select multiple elements at a time in order to view, update or modify their attributes using the attribute browser by browsing through each of the elements in selection one by one. To use this feature click on the icon available next to the icon and choose Select Elements, then you will see a red colored small rectangular cursor. Hold the mouse down and drag the cursor on the elements you wish to be selected. Once the selected elements are highlighted, you may accept or reject the selection by right clicking on the mouse and choosing Enter or Cancel, respectively. You may also press Enter or Escape on your key board to accept or reject the selection. If the selection is accepted, the user may wish to review or edit attributes of the elements in selection by browsing through these data elements using the and buttons described below. Please note that, once the user clicks on any selection tool, including the Select Elementsfeature, that initiates the red colored small rectangular cursor, he/she will not be able to do any other activity on the model unless the user accepts or rejects the selection by right clicking on the mouse and choosing Enter or Cancel. Use the Select Domain command to select elements in an already created Domain in order to view, update or modify their attributes by browsing through each of the elements in the Domain one by one. To use this feature, the user must have an already created Domain in the project. If so, the user may click on the icon available next to the icon and choose Select Domain. Now all the elements in the Domain are in selection, and the user may wish to review or edit their attributes one by one by browsing through these data elements using the and buttons described below. Find by ID This button enables the user to search a network element by its ID or Description and zooms in to the element. This feature is same as the Locate Element functionality available from the Utility Menu. Zoom to an Active Node Zooms the drawing area map in to the node or the link currently active. Open Default Using this feature, the user may review the default attribute data used when new data elements (e.g., Rain Gage, Junction, etc) are created. Click on the button, and select the data element type for which you need to review the default settings on the resulting dialog editor, then click OK. The attribute browser displays default settings for the data element , and allows you to modify the settings. Save as Default This tool enables the modeler to save attributes of a data element (e.g. Subcatchments) as a default so that the same attribute data is used when new data element, in this case Subcatchment, is created. Save Current Record By clicking on this button, the user saves the latest changes made on the attribute browser. Reset Reverts any changes made on the attribute browser to its previous state at the time of the last save operation. Once a save operation is performed, any changes made to the current record become permanent. Delete Deletes the active data element. Recall Recalls the last deleted data element. Report Opens the report manager and displays output report for the selected element for a maximum report duration of one day. Click on an element for which you wish to see output report, and click on this tool. Graph Opens the report manager and displays output graph for the selected element for a maximum report duration of one day. Click on an element for which you wish to create an output graph, and click on this tool. 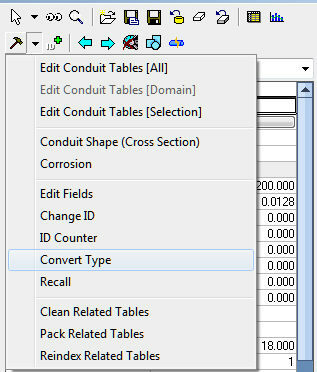 Tools Using this command, the user can access certain dialog editors provided by InfoSWMM to provide attribute data related to the currently active data element (e.g., Junction, Conduit, Subcatchment, etc) that may or may not be provided through other tool buttons in the attribute browser. Click on the Down Arrow icon to launch the Tools menu. Edit Fields – Customize database tables. See Edit Fields. Change ID – Change the ID of this data element. See Change ID. Convert Type – Change the data element type. See Convert Type. Clean Related Tables – Removes database records without matching network components in the map display. See Clean Database. Reindex Related Tables – reconstructs internal database index. See Reindex Database. ID Counter Use this feature to set the automatic ID assignment option by selecting the Prefix, Id counter, and the increment steps as you wish. Open Google Maps Choose a junction then click this button to open an internet browser window with Googlet Maps with the junction at the center of the map. Note: The correct coordinate system must be specified for the data frame for the feature to work. Add a background map that has the correct coordinate system. Use the Redraw, Transformation or Move tool to bring the existing elements to match the background map. Specify the right coordinate system in the Project Preferences. Back Using this button the modeler can browse backward (from the bottom of the list) through the data elements listed in the History Combo Box ( ) of the Attribute browser. Elements selected using one of the three selection tools described above (i.e. Select Element, Select Elements, Select Domain) are automatically listed in the History Combo Box and are available for browsing. Forward Using this button the modeler can browse forward (from the top of the list) through the data elements listed in the History Combo Box ( ) of the Attribute browser. Elements selected using one of the three selection tools described above (i.e. Select Element, Select Elements, Select Domain) are automatically listed in the History Combo Box and are available for browsing. Clear History Clears or empties the History Combo Box. Initial Pollutant Buildup Initiates the initial buildup data editor and enables the model to input these data for the Subcatchment. Infiltration Initiates the infiltration editor and enables the user to input infiltration attribute data. Groundwater Initiates the groundwater editor and enables the user to input groundwater data. Land Use Assignment Initiates the Land Use Assignment editor and enables the user to input land use coverage data. Pick Receiving Node Enables the user to pick an outlet node ( i.e., the node that receives runoff generated from the Subcatchment) for the Subcatchment. If this button is not available, please find the command in the Tools drop-down menu described above. Inflow Initiates the inflow editor and enables the user to input node inflow data. Treatment Initiates the treatment editor and enables the user to input node treatment function. X Section Initiates the cross-section editor and enables the user to input channel shape and size information. Corrosion Initiates the corrosion editor and enables the user to input conduit alkalinity information. Initial Status Activates the initial status editor and enables the user to specify initial status of the hydraulic structure. Simple Control Initiates the simple control editor and enables the user to specify simple control rules for the link. Level Control Initiates the Level Control dialog box and enables the user to automate the specification of pump control levels.